Lets Go Green and save money. Usually those two things don't go together, but it does in the pool industry. Pentair’s IntelliFlo VS-3050 variable speed pool pump has changed the rules by allowing you to save money, get better pool water and save time. What is this magic you ask? A traditional pump runs at one, maybe two speeds, but you can't control how much water you move. The pump is either on or off. A Pentair variable speed pumps allow you to set the speed of the pump which allows you to control how much water is being moved. If you move your water longer at a slower speed you will save money can clean your water better. Did you catch that? If your run your pump SLOWER for LONGER, you will save money. Dollar Bills. $$$$. Green Backs. If you run a variable speed pump at a low speed for 24 hours a day, it will cost less then running a 1hp pump for 10 hours a day. By running the pump 24 hours a day, you will also get cleaner water (slower water filters better), more chemically balanced water, and a more evenly balanced water temperature. Earth magnet motors produce less heat & vibration. The pump will receive less damage to the components and other equipment. Priming your pump is easier and faster. Do you really care? 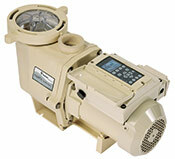 If so, here is a quick global overview of the variable speed pool pump. Pentair’s variable speed pump as a permanent earth magnet motor (same as in Hybrid Cars). Based on that motor, we can tell it how fast to spin and thus control the amount of water it moves. How Much Pentair Variable Speed Pump Save You? Pentair states that you can save up to 90% a year, but I think the number is closer to 50% - 75%. Either way you look at the numbers a variable speed pool pump will save you money. Say after taxes and fees, your average kwh is $0.15, you can expect to save roughly $620 – $1,360 per year . . . compared to running a traditional pump 6 – 12 hours for a 20,000 gallon pool.